For the Record - A Cure for Winter Blahs! Home » Whats New in town » A Cure for Winter Blahs! A Cure for Winter Blahs! If you are like me, this time of the year I start getting the winter blahs and start thinking of spring and my flower gardens. The other day I spent some time on Pinterest looking for “garden art.” I found some really easy, fun ideas I wanted to share! The first one that caught my eye looked so cute and easy! Called Garden Whimsies, they are made with terra cotta pots and saucers. Simply paint the pot in one color and paint the saucer in a contrasting color, when dry paint dots on them! They will look like darling mushrooms for your gardens!! 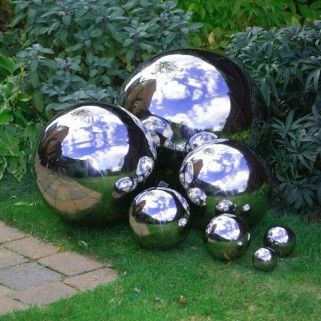 I LOVE gazing balls and came across this idea on making your own mirror balls. What really attracted me to this idea is using recycled items, such as old bowling balls. The only other thing you need is a can of Chrome Metallic spray paint that you can get at Hobby Lobby or any crafting store!! So much cheaper than buying something like this at a store! Clean whatever ball you are going to use with rubbing alcohol before painting, then lightly spray one side and let dry. Roll the ball to the other side and spray that side. Repeat as often as you like to achieve the amount of reflection you want. Spray with a clear gloss when the paint is dry, and that is it!!! One can of spray will make 3 balls, the size of a bowling ball. Be creative when displaying these shiny, mirror balls. You can put them on a pedestal, an old bird bath, or as displayed above and place them strategically throughout your yard and gardens. Imagine the sparkle that will be added to your yard and gardens! Have fun with the above projects!! There will be more to come!! Comments Off on A Cure for Winter Blahs!